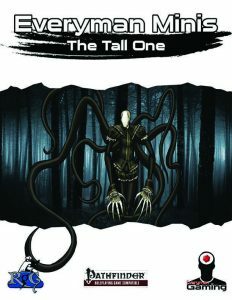 Fantastic take on the Slenderman-myth! Comes even with a cool ballad! This installment of the Everyman Minis-series clocks in at 9 pages, 1 page front cover, 1 page editorial, 1 page advertisement, 2 .5 pages of SRD, leaving us with 3.5 pages of content, so let’s take a look! On the introductory page, we get the Fear cleric subdomain in two different versions – one associated with void, one associated with evil. Both btw. have different replacement spells. The void version focuses on what you’d expect in that regard – we get crushing despair, wall of force and prismatic wall. The one based on evil focuses on low-level fear-related spells. The void variant replaces the base power with aura of isolation, which can be activated as a standard action for 3 + Wis rounds per day. Enemies in the aura become sluggish, treating it as difficult terrain. They also can’t provide flanking bonuses. Or benefit from aid another. The subdomain based on the evil domain instead replaces the 8th level power, which allows you to, as an immediate action, increase your damage output versus targets suffering from a fear effect. The damage is untyped and nets you temporary hit points. Limited daily uses and restriction on melee weapons make me okay with it. Okay, that out of the way…The Tall One. We’re looking at a fully statted Great Old One-level of being here – CR 28, pure glory. The fellow can grapple sans being grappled and has all the cool tricks you’d associate with Slenderman: Memory alteration, shapechanging, dimensional abduction, immunity to gaze attacks, etc. The guy can mark victims and it can wreck even high level PCs: Massive immunities and resistances, 8 attacks, all of which can rend the minds of victims. Full synergy with the sanity rules from Horror Adventures. Breaking dimensional locks. Undetectable. AMAZING. The build is a gloriously wicked killing machine. The pdf also includes notes on the Tall One per se, its cult…and something amazing: A half a page long ballad of the Tall One! Yes, its text is reproduced and we even get notes on its genesis! Editing and formatting are top-notch, I noticed no hiccups on a formal or rules-language level. Layout adheres to Everyman Gaming’s two-column b/w-standard with full-color artwork for the Tall One provided as a sprinkle of color. The pdf has no bookmarks, but needs none at this length. Alexander Augunas knows how to craft critters that are worth their CRs. The Tall One is a gloriously-deadly super-villain/force of nature that perfectly encapsulates the Slenderman-myth. Beyond the mechanics, we get glorious fluff and the ballad adds icing on an awesome cake. I adore this humble supplement. 5 stars + seal of approval. Now, should I rewatch Marble Hornets? You can get this inspired, amazing little pdf here on OBS!